Here's to September! I failed to do my July bit so I was pretty determined to be here now! Lien as our Kitchen of the Month chose for us to bake a tropical bun, filled with creamy coconut. Combine all the dough ingredients and stir them together. Knead the dough until smooth and souple. At first it’s very sticky, but after kneading it shouldn’t be very sticky anymore. Place the dough in a lightly greased bowl, cover and leave to rise fora bout 1½ hours or doubled in volume. Now make the filling. When using dried coconut (80 g), it needs to soak in a bowl with boiling water. Leave soaking for 10-15 minutes. Mix the cornstarch and sugar in a seperate little bowl before adding it to the coconut. Melt the butter in a saucepan, add the coconut-sugar mixture and keep it on a low heat until it thickens, a few minutes. Keep stirring to avoid it burning. Take it of the heat and leave to cool. When cooled, place in the fridge. About 30 minutes before assembling the roll, take the filling out of the fridge. Stir in the remaining 4 TBsp of coconut in. At first the filling might be a bit stiff, but a little stir will soften it enough. Set aside. Divide the dough in two parts. Start with one piece, and roll it out into a rectangle of 30 x 16 cm. Now cut it lenght wise in two equal parts, so you have two long thin strips. Place a quarter of the filling evenly over the middle of the strip. The filling should be fairly dry, don’t place wet filling on the dough. Flip over one long side of the dough over the filling, then flip over the other side. The two sides should slightly overlap. Close the seam by pinching the dough together. Turn the roll seam side down. Cut the roll in three equal parts. Push the filling back a little, so you can close the cut sides, so the filling is no longer to be seen and can’t leak out. Repeat with the other three strips (the one that you have rolled out and the two strips you make of the remaining dough). Place the rolls, 4 cm apart, on parchment paper placed on two baking sheets. Cover them with lightly greased plastic and leave to rise for 35-45 minutes. They are ready when a light indentation, you make with a finger, stays visible. While the dough proofs you should preheat the oven to 190ºC. Let the rolls cool on a wire rack. Eat them luke warm or at room temperature. So, this is what my filling looked like, I wouldn't call it really dry but it sure was paste like, all sticky and malleable. My filling weighed in about 200 grams, so I used 50 grams for each strip of dough. And I added a bit of orange zest to the dough. Why? Just because I could. As I said, very easy to work with, I rolled 7 by 14 inches which made the filling spreading thin but then again it was easy to fold the dough over the filling, as seen below. The first two strips I did as I was told and cut the long roll in 3 equal parts. The other two long rolls I decided to cut in 4 equal parts. Easier and I like the shorter plump rolls you get this way. See below. Here again with the resulting buns. Family shot on top and the inside. Lien, they remind me of "Brabantse worstebroodjes" in looks! They feel wonderfully light, smell rich and sweet. Haven't tasted them yet. I cut one open for a picture (it was the most crooked looking) and indeed the filling not right in the middle. Quite airy don't you think? I brushed the hot buns with a little butter. Mmmm quite yummy! The filling is moist enough to enhance the bread around and somehow it tastes a bit Asian although there is no reason for that. I really do like them! Good choice Lien!! It would be great if you could join this challenge, get all tropical, knead, post and let us know how it went. And join us as a Bread Baking Buddy, send your results and what you thought of this to the Kitchen of the Month (that's Lien this time!) 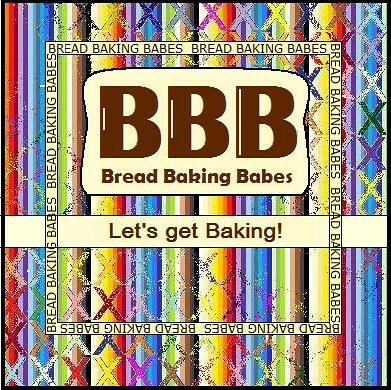 type BBB Coconut Rolls as subject to notitievanlien(at)gmail(dot) com and you'll be send a Bread Baking Buddy Badge that you can add to your blogpost if you like. Deadline the 29th of September. Take on the challenge and let's bake! Yes Karen, they looked quite similar to the worstenbroodjes (note to self; let's make those again soon). The new amount of filling (that's now in the recipe) is better, you just need enough filling for a roll to be called filled. I love the glossy look of your coconut rolls! I brushed mine with melted butter as well, but didn't get the sheen. Very nice! I think the little shorties are super cute! I like the smaller ones, too, and not surprised that the man in your life liked these...so did mine! Brushing with butter was smart...gave them that lovely shine. My filling looked pretty much like yours. But the resemblance ends there. Your rolls have such beautiful loft! And the colour of the crust is lovely as well. I bow down to you. Interesting to see it after it was turned into a paste. And I wouldn't have thought to add cinnamon. Lovely rolls! So pretty with the butter giving them lots of shine!